When you're ready to head into the great outdoors, check out this Forest River A213HW hard side high wall pop-up camper! It features room for the whole family with two twin beds with a nightstand in between the two. There is also a booth dinette for you to enjoy your meals at, as well as transform into an extra sleeping space, plus there is a front dormer to promote more open space and comfort. 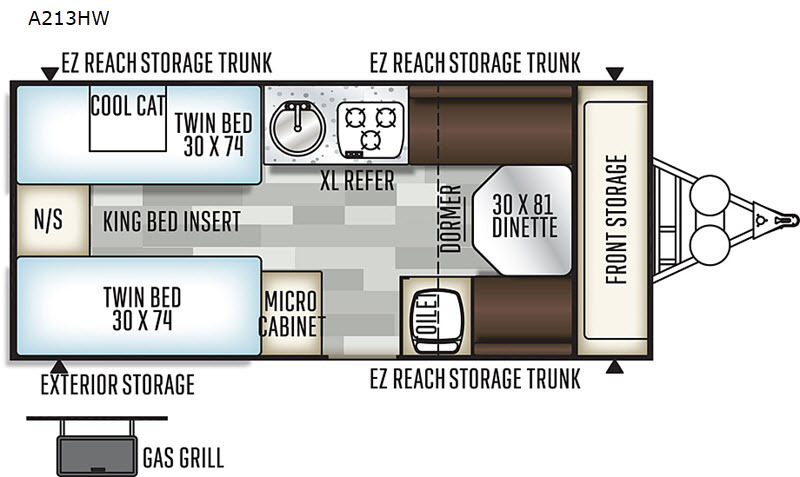 There is plenty of storage throughout the interior and EZ reach exterior trunk, plus other exterior storage locations. A distinct feature with this model is the residential toilet, no more trips outdoors! In any Forest River Rockwood Hard Side pop-up camper you will find the perfect product for your camping adventure. 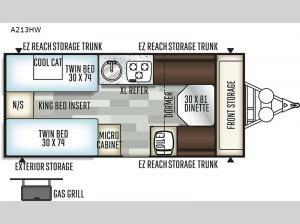 These units offer plenty of luxurious features from home such as a WiFi range booster, AM/FM stereo with Bluetooth USB ports, stainless steel look appliances, and a Slatewood interior with wood look flooring and leather appearance seating. The exterior construction consists of a one piece vacuum bonded fiberglass roof with a metal interior ceiling, a one piece undercoated structure wood floor, and an E-coated tubular steel frame, plus there are four E-Z crank-down stabilizer jacks with sand pads. You will also love the privacy this camper provides with the privacy curtains throughout, the two front roof tinted windows with shade, and the large rear roof tinted sky light with shade, plus there is a large, opening picture window for you to enjoy your scenery.